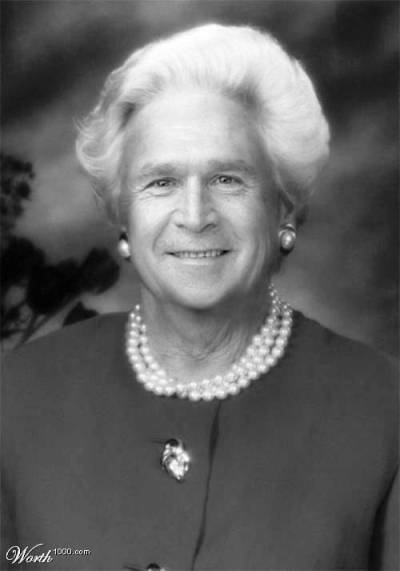 George W. Bush Is A Dead Ringer For His Mother. I’m sure you’ve noticed the similarities between the President and his mother, but have you ever seen the proof look quite like this? 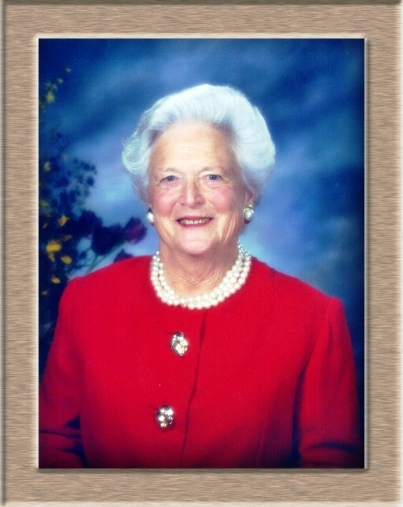 I do believe the original picture from which this was derived, is the following picture of his mother, Barbara Bush. A side note: George W’s mother is commonly referred to as Mrs. Barbara Bush, since his daughter’s name is also Barbara Bush. Some more George W. Bush fun, courtesy of The Late Show with David Letterman. She was born in 1925 in Flushing, Queens in New York City. Her father Marvin Pierce was president of McCall Corporation, the publisher of the popular women’s magazines Redbook and McCall’s. Barbara’s ancestors include Thomas Pierce, an early New England colonist, and Franklin Pierce, the 14th president of the United States. She met her future husband, George Herbert Walker Bush at the age of sixteen while attending a Christmas dance. In 1984, Bush told the press that she could not say on television what she thought of then Vice-Presidential candidate Geraldine Ferraro, but “it rhymes with rich”. In 2006, it was revealed that Barbara Bush donated an undisclosed amount of money to the Bush-Clinton Katrina Fund on the condition the charity do business with an educational software company owned by her son Neil Bush. previous post: San Francisco Dyke Day 2007 Wrap Up. next post: Tom Sizemore Sentenced To Jail. 51 queries in 1.409 seconds.